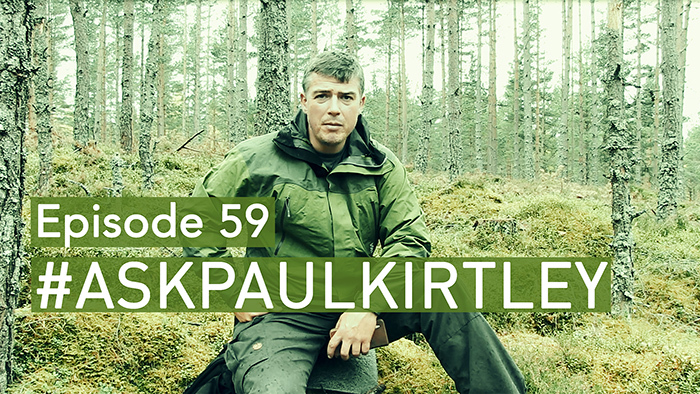 In this episode of #AskPaulKirtley… I answer questions about improvised camp seating if you can’t find a log nearby, the importance of first aid training and what to put into first aid kits, how to calculate how far you can hike plus keep track of your speed, storing compasses at home and in the field, tips for avoiding midges, identifying unusual growths on tree leaves and how to collect, process and eat ribwort plantain seeds. If you walk 6 km/h you will reach your sleeping bag earlier and it is easier to count! After 10 minutes you made 1 km, after 30 minutes you made 3 km after 60 minutes you made 6 km. After 10 hours you have the daily marching distance completed. Easy to count, easy to walk, no problem! That was the traditional system for the marching Prussian army , in flat country, of course. For weekend hikes and holydays you might stop after 30 kilometers. Slowly becoming old too , I think about buying a lightweight Hammock. That should bee a comfortable seat in the summer. For day hikes are existing on the market 30 liters rucksacks, which have a chair included. You find them in hunters and fisher men shops. That is of course a compromise but could be an option for aged persons. In the area around Berlin we have a lot of people in Hammocks and on chairs watching out for people who march with 6km/h daily distances of 60 km. Unfortunately it came out of fashion. Hi Brian, yes it is important to set the speed to the slowest person (and for the fitter or faster people to be dressed warm enough if they are not working at their optimal capacity). It’s also important to make sure the fit people don’t rest until the slower person arrives then everyone sets off again! Keeping an eye on your buddies is also super important. Group responsibility for the group in this regard, not just the leader. The navigation tips were especially useful. a lot of good information in this video.. thanks for sharing your knowledge. My pleasure Bill. Thanks for watching. Another interesting episode, thank you for your continued insight and views. For a seat my first thought was a hammock, I have used mine that was on a number of occasions. After doing your ‘Expedition Canoe courser’ in 2016, began to look for a comfortable kneeling pad. Eventually I came across the folding German army sleep mat. I found that, when folded it made a good seat and should be god for kneeling on. It also works well as an insulation layer for hammock sleeping, I suspect it will be too thin for comfortable ground sleeping. The question of a comfortable seat got me thinking so I tried an idea out, using para cord I made a fishing type net one meter by half a meter, gathered the shorter ends, to make a small hammock and tried it as a seat. It worked and was reasonably comfortable. I may remake it so that it is all a single piece of para cord and carry it as some of my cordage (if required). Thanks for the extra tips re hammock and German mat Robin. Who trains your first aid? I am an EFR instructor myself and I’d like some training on Wilderness First Aid, because sometimes we dive in remote locations. Do you know any good instructors in the UK, or even better, the Netherlands? Thank you, Nukko. Hi Nukko, we hire Adam Gent and his company Real First Aid for our first aid training. He is very good. Only hard Germans are able to sleep on this mat, especially on rocks, ice and snow! No, on soft forest ground it is a good lightweigt option. In colder conditions it is necessary to use two of them, collect leaves or twigs under it or you have the option to fold it once. So you get two layers under you and a short mat. The Rucksack as a pillow and something under the legs too and it works well even in Winter times. It is more a bushcraft tool than a camping mat. Hi Paul, just re-listened to this on my commute home and realised you answered my question in it – best ways to deal with midges? I actually asked that via twitter after reading your team’s Frontier Buscraft article on bugs and bites. Ans: Wind, smoke, headnet, gloves, season – all sensible stuff. I was wondering if you had any other experiences? – does a certain type of repellent work best? What about if you’ve drunk loads of whiskey or munched loads of garlic? Old wives tales or reckon there’s something in it? What about various moisturisers? Asking from an experience after being eaten alive years ago in the Lakes on my ML training… I was running round the moors doing an impression of a madman/bushwhacker!